On the hottest day of the year so far, it was fitting to be attending a play set entirely in a family's summer home during one summer's day. 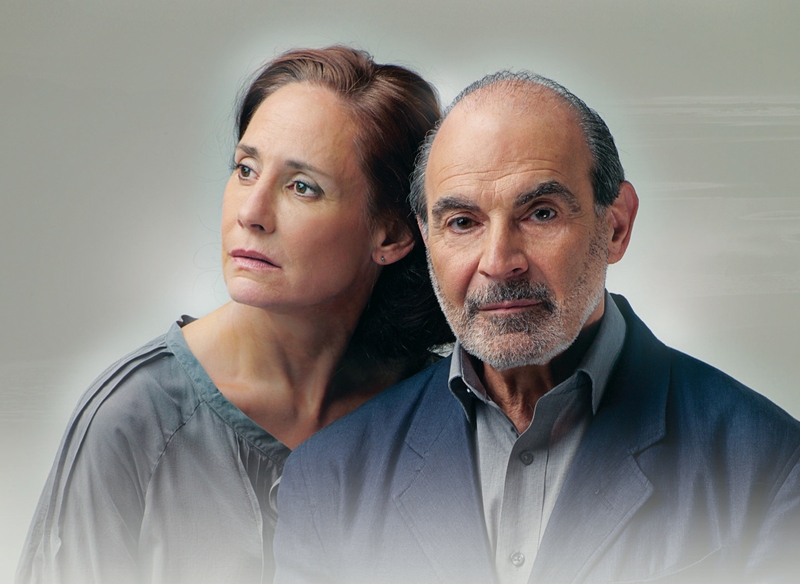 Starring David Suchet and Laurie Metcalf as James and Mary Tyrone, Long Day's Journey Into Night puts the Tyrone family under a magnifying glass creating compelling, and sometimes uncomfortable, viewing. Although it is set in 1912, the family face challenges that share many similarities with the dysfunctional families that permeate television soap operas. Prescription drug abuse, worklessness and heavy drinking are themes that readily connect the Tyrone family to issues that many families face today. The beautiful summer house set provides an insight to the family via a mish mash of furniture. Even the central light-fitting in the living room provides a focus as James drunkenly and gingerly balances on the table to turn it on in Act Two. As the head of the family James Tyrone, David Suchet paints the portrait of a hard-working immigrant convincingly with a quick temper and some witty one-liners. James Tyrone is tormented by the failings of his sons and David Suchet captures the painful and volatile relationships with poise. From the opening scenes, Laurie Metcalf is exquisite as Mary Tyrone. She captures the essence of a woman unspooling slowly perfectly. The subtle changes in the way she carries alert the audience to the fact that all is not as it seems. Throughout Act One the audience is left guessing to what the problem could be and this mystery adds to the character. The nervous energy that she brings to the stage is felt by the rest of the family and audience alike. As the sons who are seemingly the source of much of their parents anguish, Trevor White and Kyle Soller bring the tempestuous, bitter Jamie Tyrone and ailing Edmund Tyrone to life creating energetic and personable characters. Kyle Soller is on stage for almost the entirety of Act Two and his interactions with his father and brother create the core to uncovering the truth of the pain and darkness that blights the whole family. The family’s pain is evident throughout which makes the play far from light viewing. It’s plain to see why Long Day's Journey Into Night is so critically-acclaimed and the excellent cast make this production unmissable.